Text: The arena of Nîmes holds celebrated bullfights some afternoons, but in the evenings it houses a cinema, which is a rather more cultured thing than a bullfight. Currently. it is playing The Ten Commandments, that great American film that has already been shown in Germany. In the evening I take myself to the arena. You have to hope it will stay dry, and in Nîmes the chances of that are good. It rains very rarely here, and never for long. The stones cool off in the evening. A couple of arc lamps light up half the arena. The other half is left in shade. The ghostly white forms of the huge crumbling blocks of stone loom up out of it. They have already been through so much, these stones. In the Middle Ages, two hundred families lived in the walls of the arena and built a church (in one of the spacious arches). In wartime the arena became a fortress. It survived the changing epochs, and time and again was emblematic of its era. Now, in 1925, it is no longer a church but a cinema, admittedly a cinema showing The Ten Commandments. At a time when these commandments are not much obeyed, that’s already saying something. In the middle of the arena there’s the screen, like a white board in a classroom. In the archway opposite, the projector is purring away. 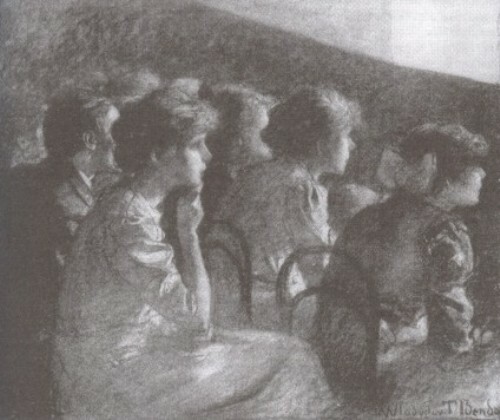 The orchestra sits in front of the screen. The members of the audience (for fifty centimes) are free to wander about on the upper and lower stone seats. Some, who prefer to be cool and lofty, stand on the top edge of the wall, black against the blue sky. It’s a most marvelous cinema, cool, clean, without any danger of fire, and much more magnificent than a cinema has any need to be. If any Americans happen by, then surely by next year they’ll have put up a big concrete bowl, the largest in the world, with velvet trim, water closets, and glass roof. Before the show the children play catch behind the screen, and hide-and-seek, and grandmother’s footsteps. All the children of Nîmes – and the people here have many children – go to the cinema. The mothers don’t forget to bring their infants. The youngest visitors are admitted free, though admittedly they don’t see anything but lie on their backs under the night sky, with open mouths as though to swallow the stars. It seems almost feasible. Hereabouts the night sky is very open-handed with shooting stars. They fall not in an are, as they do in the North, but sideways, as if the heavens were rotating. There are several kinds of shooting stars. While the sentimental, ocean-diluted Bible is being shown on screen, the best thing to do is watch the shooting stars. Some are large, red, and lumpy. They slowly wipe across the sky, as though they were strolling, and leave a thin, bloody trail. Others again are small, swift, and silver. They fly like bullets. Others glow like little running suns and brighten the horizon considerably for quite some time. Sometimes it’s as though the heavens opened and showed us a glimpse of red-gold lining. Then the split quickly closes, and the majesty is once more hidden for good. From time to time a large, shooting star falls quite close. Then it’s like a silver rain. Each one vanishes in the same direction. Then the apparent quiet is restored to the deep blue, that everlasting fixity of the stars, of which we still manage to feel that they move, even if we didn’t know it. There they are again, the old familiar constellations that remind everyone of childhood, because it was only as a child that one gazed at them so raptly. They are everywhere. There you are, so remote from your childhood, and yet you meet it again. That’s how small the world is. And if you think some of it is foreign, you’re mistaken. Everywhere is home. The Great Bear is a little nearer, that’s all. It was a good idea to put on a film in the old Roman arena. In such a cinema you come to comforting conclusions, as long as you look at the sky, rather than the screen. Comments: Joseph Roth (1894-1939) was an Austrian journalist and novelist, best known for his novel Radetzky March. The Arena of Nîmes is a Roman amphitheatre built around AD 70 and is used today for public events, including concerts. The film mentioned is The Ten Commandments (USA 1923), directed by Cecil B. DeMille. This entry was posted in 1920s, France, Newspapers and tagged Arenas, Audiences, Children, Joseph Roth, Musicians, Nîmes, Screens, Seating, The Ten Commandments (USA 1923). Bookmark the permalink.